Manitobans have been weathering major floods since the early 1800s. In the past 60 years, the floods in 1950, 1997, 2009 and 2011 have caused substantial damage, especially along the Red River and Assiniboine River basins. At the same time, Manitoba's flood fighting efforts have improved greatly and have significantly reduced the number of evacuations and the amount of damage spring flooding can cause. Major flooding took place in Winnipeg and the Red River Valley in April/May/June. The melting of heavy snow caused the Red River to reach flood levels in Winnipeg by April 22. 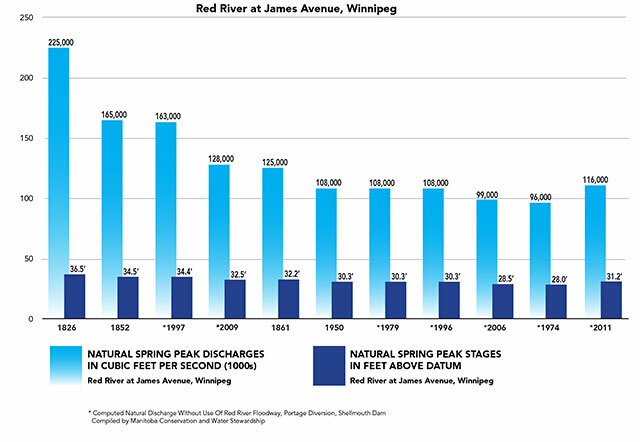 A heavy rainfall in early May caused the river to peak at a record 9.2 metres (30.2 feet) at James Avenue in Winnipeg. The levels stayed above the flood stage for 51 days. The water depth reached 4.6 metres (15 feet) in low lying areas. A state of Emergency was declared and the Canadian army and Red Cross were brought in to help protect residents and property and help with evacuations. Over the course of the flood, 100,000 residents (one third of Winnipeg) were evacuated from their homes - the largest evacuation in Canadian history (until the 1979 Mississauga train derailment). Approximately 10,000 homes were destroyed and 5,000 buildings were damaged. Heavy snow during the previous winter and heavy spring rain contributed to flood conditions. The flood in April and May, 1997, was the most severe in Manitoba's Red River valley since 1852. Flooding on the Red River also caused high running water on other Manitoba rivers and the Red River flood directly or indirectly affected communities in: Emerson, Rosenort, St. Jean Baptiste, Morris, St. Adolphe, , Portage la Prairie, Ste. Agathe, Norbert, Letellier, Dominion City, Grande Pointe, Niverville, Gretna, Aubigny, Lowe Farm, Riverside, St. Pierre-Jolys, Rosenfeld, Roseau River First Nation, Hadashville, Scanterbury, Brunkild, Domain, Sanford and Winnipeg. A dry summer in 1996 was followed by heavy rain in the fall that greatly increased soil moisture, creating the possibility of flooding. The winter of 1996 was unusually long and cold. There were four blizzards with high winds and heavy snow that caused extensive drifting and made it hard to measure snow levels accurately. Total basin precipitation, from the start of winter to near the crest of the Red River in early May, totalled 221 millimetres (8.9 inches), well above the norm of 130 millimetres (5 inches). This figure may be underestimated because of the difficulty in accurately measuring drifting snow levels. Gradual spring melting started in late March. A Colorado low at the beginning of April brought major snowfall of up to 90 millimetres (3.5 inches) to the Red River Valley. Melting resumed in mid-April and happened really quickly. Spring runoff volume for the Red River at Emerson (up to June 15) was 6.75 million acre-feet (8.33 million cubic decametres), representing an average runoff depth of 135 millimetres (5.3 inches). This is almost identical to the 1950 runoff volume. The runoff in spring, 1997, was especially heavy in several areas: where the Red River starts near Halstad, North Dakota; in the lower Pembina River Watershed; and on most eastern tributaries of the Red River in Manitoba. Many streams in these areas had record or near record high water flow. The Red River crested at approximately 7.5 metres (24.5 feet) at the James Avenue Pumping Station in Winnipeg. Without the flood control works, the crest would have been at 10.5 metres (35 feet). In Canada, over 7,000 military personnel were employed for 36 days to help prevent flood damage and relocate 25,450 evacuees. An estimated 1,000 homes were damaged. The 2009 spring flood was the fourth highest on the Red River in Manitoba, since 1826. Flood forecasts in February and March 2009 indicated the likelihood of a spring flood between 2006 and 1979 levels with less than a 10-per-cent chance of a flood as large as that of 1997. Spring precipitation was close to average and the melt rate was not unusually fast. A heavy rainstorm in the first week of November, 2008 was a major factor in the flood. The high level of ground frost, due to the cold winter, kept the ground from absorbing much of the spring runoff. Above-average snowpack in the US part of the watershed also contributed to the flood. Flooding in the Red River watershed was worse due to unusual ice conditions which caused blocks in the drainage system and raised river levels beyond what would have occurred under normal conditions. Ice jams in the Breezy Point and St. Peters Road areas raised the Red River about 2.74 metres (9 feet) overnight, at up to 0.6 metres (2 feet) an hour, to record levels. Serious ice jams from Lockport to Lower Fort Garry in the last week of March raised levels in the area to within 0.3 metres (1 foot) of the 1997 crest. If there had been no flood control works, the crest would have been 9.9 metres (32.5 feet) at the James Avenue Pumping Station in Winnipeg. The river crested in Winnipeg at 6.9 metres (22.5 feet) on April 16, at 0.6 metres (2 feet) lower than in 1997. The greatest success of the 2009 flood was the protection provided by operation of major flood controls. Operation of the Red River Floodway, Portage Diversion and Shellmouth Reservoir reduced the crest in Winnipeg by 10 feet, preventing approximately $10 billion in damages. An estimated 250 homes were damaged. In late October 2010, southern Manitoba was within a millimetre of having its wettest year on record, when a super-charged weather bomb dumped 50 to 100 millimetres of rain and snow. At freeze-up, soil moisture levels were the second highest since 1948; only 2009 had more. Cold temperatures throughout the winter resulted in deep soil-frost penetration, meaning spring melt water was likely to spread out instead of soaking in. At the season's midpoint, the snowfall total was at a 15-year high. When spring arrived, cold temperatures slowed the melt and delayed expected flooding. By mid-April, there was still plenty of snow on the ground, and nowhere for the water to go when it melted. Then came heavy spring precipitation, with rain and snow that added to an already bad flooding situation. Waters climbed steadily on several rivers, including the Red, Assiniboine, Souris, Pembina, and Qu'Appelle, and on several lakes. In early April 2011, Manitoba declared a high flood risk for six rivers, including two that pass through Winnipeg. The Red River peaked in Winnipeg on April 7, when an ice jam drove up water levels. The high stage ranked third largest in the past 150 years. The Assiniboine River crested just days later. Once again, the Red River Floodway saved the day, along with some help from nature as there was no major rain or snow in the area during April, May or June. On May 9, the Manitoba government declared a province-wide state of emergency, issuing evacuation notices for several municipalities along the Assiniboine River. Brandon was at the epicentre of the months-long flood battle, where the Assiniboine River reached its highest level since 1923 and continued to rise. The river was nearly seven metres higher than normal and 20 to 30 times wider in some places. Flooding on the Assiniboine near Brandon lasted 120 days and was the largest on record. In late May, Lake Manitoba, Lake Winnipeg and at least four others reached record water levels. Hundreds of residents and cottage owners were ordered to leave due to high winds and waves. Lake levels were higher than t in banner year 1955, and were enhanced by water diverted from the Assiniboine River. A late May storm with strong north winds sent water crashing against dozens of homes at Delta Beach on the south shore of Lake Manitoba. The inundation was so far inland that beachfront cottages were located three km "out to sea." Spring flood peaks for 2011 (in feet above sea level): Emerson (790.3), Morris (779.3), Winnipeg (19.6 - nearly three feet lower than in 2009), Selkirk (724). The 2011 flood featured the highest water levels and flows in modern history across parts of Manitoba and Saskatchewan. Statistically, the flooding on the Assiniboine River in 2011 was estimated to be at levels experienced once in 330 years. On Lake Manitoba, engineers called the flood a one-in-2,000-year event. Governments at all levels spent close to $1 billion on flood fighting and compensation (Environment Canada). Epic snow melts occurred everywhere - from the Qu'Appelle Valley to eastern Manitoba and from The Pas south to the Canada-U.S. border - resulting in more acreage under water than ever recorded. Due to unprecedented flooding in 2011, an emergency outlet channel was built to drain flood water from Lake St. Martin and Lake Manitoba into Lake Winnipeg. The channel opened on Nov. 1, 2011. More than 130 workers and over 100 pieces of heavy equipment were involved in the construction project. Now, the Fairford Dam is able to remain open through the winter, which helps lower the Lake Manitoba water levels and results in lower levels on Lake St. Martin. 7,100 Manitobans were displaced from their homes, with 2,700 still evacuated at the end of the year. Flooding affected three million hectares of farmland, requiring ranchers to move thousands of livestock. Local states of emergency were declared in 70 Manitoba communities. Flood waters forced the closure of 850 roads, including parts of the Trans-Canada Highway. The massive flood fighting effort involved thousands of emergency measures officials and volunteers, including inmates from a local jail, and 1,800 members of the Canadian military.